Last week we looked at the subject of prayer from a uniquely Scriptural perspective and we found out that it’s an act that is undertaken to a greater or lesser extent by every human being. (Slide) From the most primitive to the most sophisticated, from the most wicked to the most righteous, from the most religious to the most non-religious, for the most significant or insignificant of reasons, prayer is undertaken in a countless multitude of ways by everybody. Everybody prays. So this subject is not foreign to anyone, even the unbeliever and the atheist has some core knowledge of the concept of prayer and secretly they’ve all attempted it. (Slide) Adolf Hitler prayed. In fact, he would sometimes spontaneously pray during his speeches. Few world leaders would even think about doing this during a speech. Every enemy of Israel had a religion and therefore every foe of Israel prayed. Pharaoh prayed, Haman prayed, Goliath prayed, Nebuchadnezzar prayed, even Cain prayed. A person who prays is no more righteous than a person who says thank you to a waiter who arrives with their meal! It depends who you pray to and what your motives are. But prayer is the most misunderstood and lightly treated activity in the world. Most people underestimate prayer’s full potential. (Slide) We looked at how prayer is defined in Western thinking as a purely supplicatory act, taking on the form of petitioning, pleading, begging, imploring, beseeching and even demanding. It is from this narrow view that it receives the word ‘prayer’ derived from the Latin word ‘precor’,’ meaning to ‘beg’ or ‘supplicate.’ No doubt, such a term is given for this act by the Greco-Roman mindset because of its outward appearance, which often takes on various degrees of this definition. But the true definition of prayer from a purely Hebraic perspective describes the inner workings of prayer rather than the outer workings, carrying the name ‘tefillah,’ which means ‘to self-analyze with a view of closing down any distance between a man and his Creator.’ Tefilah shares its root with yefalel, which means “judgment,” and with pallel, which means to “judge.” To pray (lehitpalel) is to judge oneself. 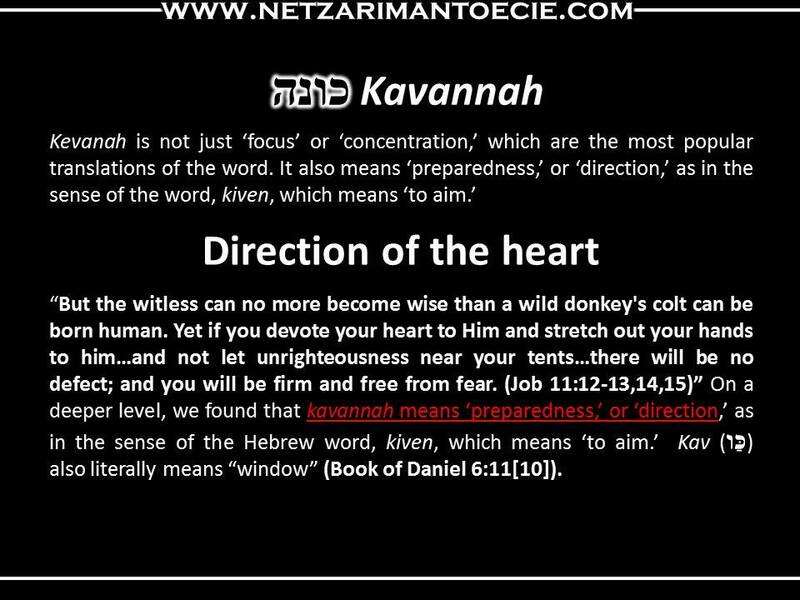 So we looked at tefillah (self-analysis), avodah (service) and kavannah (direction). The specific type of service and direction we looked at was avodah shabelev and kavannah shabalev (the ‘service of the heart’ and the ‘direction of the heart’). Many people today do not see the need for regular, formal prayer. "I pray when I feel inspired to, when it is meaningful to me," they say. A full walk before Elohim isn’t one marked by waiting around for moments of inspiration. We have to stir up inspiration. The attitude to pray when inspiration comes alone overlooks the need to practice prayer. If we want to do something well, we have to practice it continually, even when you don't feel like doing it. This is as true of prayer as it is of playing a sport, playing a musical instrument, or writing. The sense of humility and awe of Yahweh that is essential to proper prayer does not come easily to modern man, and will not simply come to you when you feel the need to pray. If you wait until inspiration strikes, you will not have the skills you need to pray effectively. If you don’t set fixed times for prayer, you will rarely find a desire to pray and then if you do, prayer will be difficult. If we pray beyond times of hardship and great rejoicing, we will learn how to express ourselves properly in prayer. 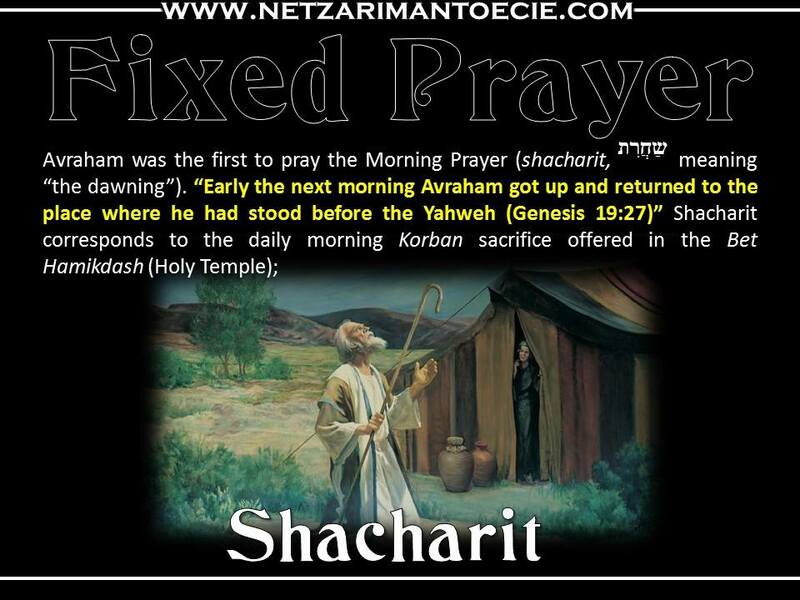 But where do these regular fixed times of prayer appear in the Torah? 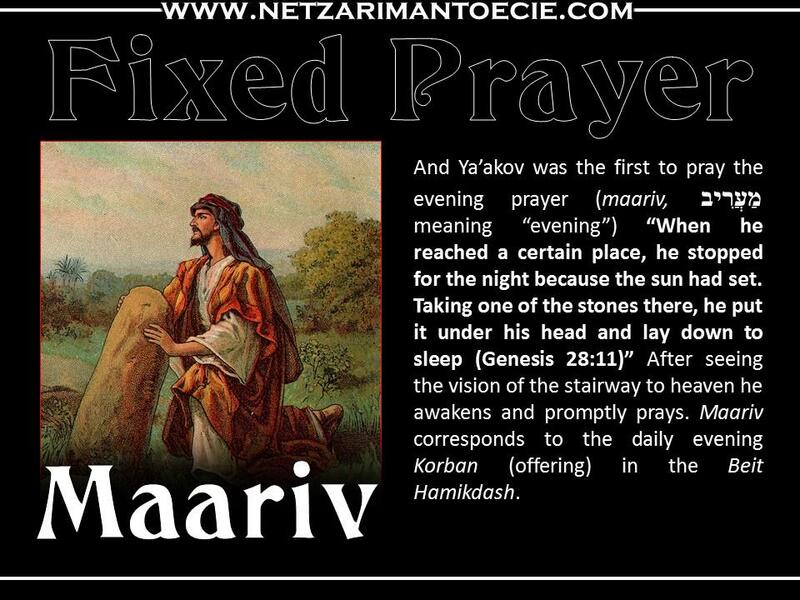 (Slide) And Ya’akov was the first to pray the evening prayer (maariv, מַעֲרִיב meaning “evening”) “When he reached a certain place, he stopped for the night because the sun had set. Taking one of the stones there, he put it under his head and lay down to sleep (Genesis 28:11)” After seeing the vision of the stairway to heaven he awakens and promptly prays. Maariv corresponds to the daily evening Korban (offering) in the Beit Hamikdash. In the Zohar (where the inner meaning of the Torah is revealed) it is explains that each of the three Patriarchs represented a particular quality which they introduced into the service of Elohim. Avraham served Yahweh with love; Yitzhack—with awe; Ya’akov—with mercy. Not that each lacked the qualities of the others, but each had a particular quality which was more in evidence. Thus Avraham distinguished himself especially in the quality of kindness (חסד) and love (אהבה), while Yitzhack excelled especially in the quality of strict justice (דין) and reverence (יראה), while Ya’akov inherited both these qualities, bringing out a new quality which combined the first two into the well-balanced and lasting quality of truth (אמת) and mercy (רחמים). We, the children of Abraham, Isaac and Jacob, have inherited all these three great qualities of our Patriarchs, and this enables us to serve Yahweh and pray to Him with love and fear (awe) and mercy. (Slide) This is what it means when we read, “Bring a prepared speech with you as you return to Yahweh. Say to him: "Completely forgive our iniquity; accept us graciously that we may offer the praise of our lips as sacrificial bulls. (Hosea 14:2)” Like the Temple, we take on three key rectification services throughout the day, using our mouths as accompaniment or substitute for the offering of animals. Again in Hebrews we have a similar reference; “By him therefore let us offer the sacrifice of praise to Elohim continually, that is, the fruit of our lips giving thanks to His Name. (Hebrews 13:15)” Many interpret this as being a teaching that replaces animal sacrifices, but Hoshea, a book of the TaNaK, clearly shows us that this was always required, whether it accompanied an actual offering or was done in place of one. So if our bodies are really temples in which dwells the Ruach HaKodesh, we need to align ourselves to the tabniyth תַּבְנִית pattern of the real Temple’s daily function. The next thing we have to look at is the unique individual structure of each of the three daily prayers, but before we do this it is important to find out how the content of these prayers came about. Imagine that one hundred and twenty of the greatest computer scientists in the world are brought together and given unlimited access to the most advanced technology available to write a program for a supercomputer designed to remain state-of-the-art for all time. They are joined by visionaries able to discern every possible requirement of the future generations of computer users. This portrayal, if it where it ever possible, is but a glimpse of the extraordinary process that was undertaken the Men of the Great Assembly to compose the structure and each of the three daily tefillot.